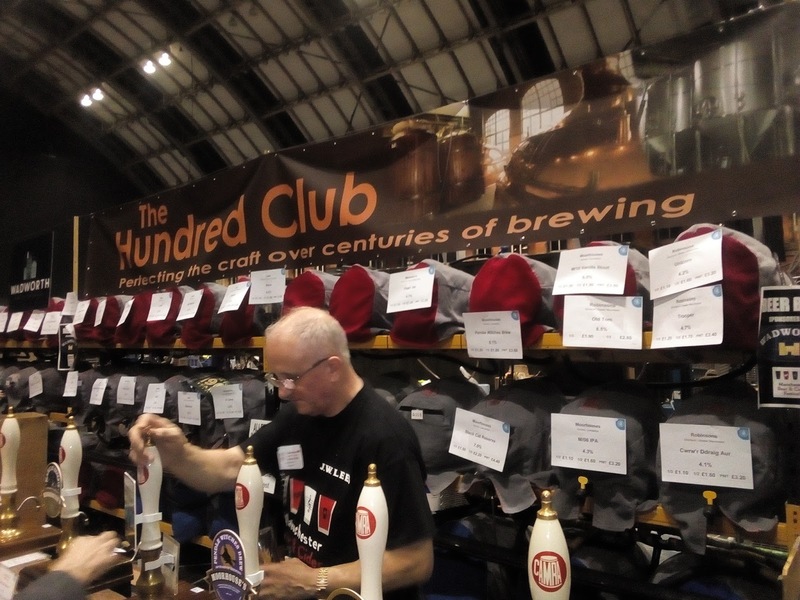 Manchester Beer and Cider Festival rolled into Manchester Central Convention Complex, the city's former Central Station, for the third time last night with an opening session for the trade, press and CAMRA members. I know some people go to beer festivals to try strangely-flavoured collaborations from obscure microbreweries, but I usually head first for the Independent Family Brewers of Britain bar, this year restyled the Hundred Club for those who have been brewing for more than a century, to drink beers from regional breweries whose products don't normally appear on the bar of pubs in the Manchester area, such as Harvey's and Fuller's, especially dark ones like milds, stouts and strong ales, as well, last night, as two new cask offerings, chewy, treacly 10.7% Fuller's Imperial Stout (normally only available in bottles) and the just launched stout from J.W. Lees of Middleton which seems mainly to be nitrokeg beer when found on draught in their tied estate. 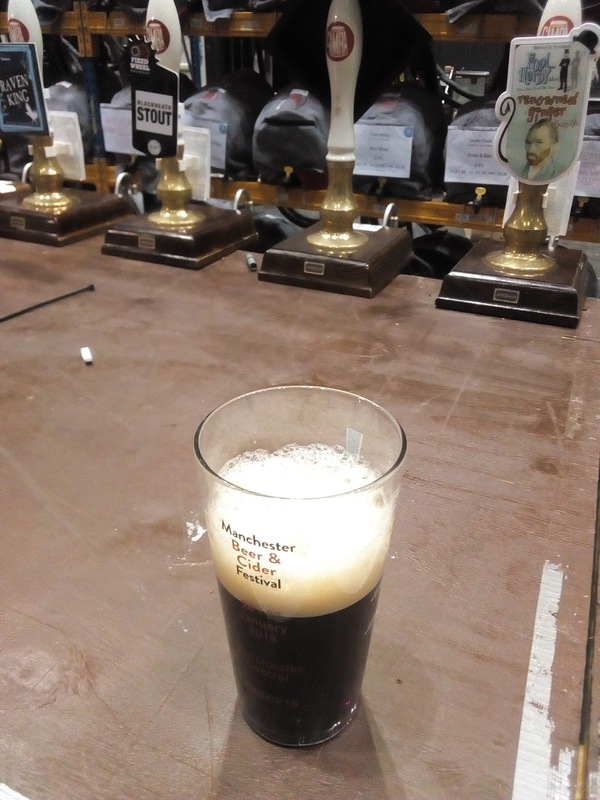 My standout beer of the session though was - as I thought it might be - one from a relative newcomer, the deliciously rich and smoky, and at 6.5% dangerously drinkable, Elland 1872 Porter which was deservedly Champion Beer of Britain in 2013. The former footballer Cyrille Regis who has died suddenly at the age of 59 after a heart attack was one of the black players who broke through into the game at the top level in England in the late 70s and early 80's, overcoming appallingly racism which was then, sadly, often regarded by fans and managers alike as just harmless banter, to be brushed off as something "normal" and to be expected. In this, although more vocal and, in the "terrace wars" between hooligan "firms", many of whom had links to the far right, which accompanied them, more violent, those chants and insults were of a piece with the society around the football grounds at which they were hurled at players such as Cyrille, with the streets, pubs and workplaces which black people returned to after matches (if indeed they had been brave enough to attend them in the first place) and with the TV comedies of the era, such as Till Death Do Us Part, with its oft-quoted bigot Alf Garnett, and the awful Love Thy Neighbour, about a white couple living next door to a black one. In particular, they were of a piece with the West Midlands and Black Country, where, along with the late Laurie Cunningham and Brendan Batson, Cyrille was one of the so-called Three Degrees of black players signed by West Bromwich Albion and managed for a time by Ron Atkinson, someone who has had his own issues with racism (albeit not, if what his former charges say is true, with his own black players): the immigrants from the Caribbean and Indian sub-continent who had come to work in its foundries and car factories in the 50s and 60s had experienced a racist backlash from the start, epitomised by the notorious "Rivers of Blood" speech of 1968 in which the Tory MP for Wolverhampton South West Enoch Powell fulminated against their arrival, but the decline of those industries in the 70s and 80s led to white working-class frustrations which expressed themselves politically in the electoral rise of the street-fighting fascists of the National Front, which gained more than eight per cent of the vote at a 1977 by-election in Powell's birthplace of Stetchford. Above all, though, Cyrille Regis should be remembered for his sublime footballing talent: here he is in his pomp playing for West Brom against Manchester City on a typically muddy Maine Road pitch in 1980. It was with some relief yesterday that I completed the Winter Warmer Wander, an annual event organised by my CAMRA branch, Stockport and South Manchester, with prizes for visiting 12, 24 or 46 pubs and drinking at least half a pint of porter, stout or strong ale, or a beer of 4.5% abv or above. I got off to a good start, beginning with a launch stagger around Stockport in mid-November which ticked off five pubs, another around Manchester's Northern Quarter that added another four and a couple on Stockport's Wellington Road North "beer slope" a week after that, which meant that by the end of the first week in December I'd already done eleven pubs, with just one more to go for the first level of prizes. The rest of the month was pretty much written off though as I was laid low with the lurgy that seems to have afflicted half the country this festive season and it was only yesterday afternoon, the last day of the event, that I felt fit enough to pop into another pub for my twelfth and final sticker. So what does a wander around pubs in Stockport and Manchester this winter tell us? First of all, the beers: nine of the beers I drank were stouts or porters, with the rest - including a couple of pints of Robinsons Trooper, in the Arden Arms, Stockport, and the Castle Hotel in Manchester city centre - premium bitters rather than strong ales (I did drink Robinsons Old Tom last month, but not in a pub which was taking part in the event). Breweries: three of the pubs I went in and beers I drank were owned and produced by local family brewers (Hydes, Robinsons) with the rest being from brewpubs or microbreweries, three of them also local (Fool Hardy, Stockport, Greenfield), and the others from further afield (Saltaire, Five Points, Northern Monk, Harviestoun, Rossendale). Pubs: three were what you might call traditional locals, albeit with sizeable dining and/or live music areas (the Arden Arms, the Castle Hotel and the Horse and Farrier, Gatley), with the rest being brewpubs and/or specialist beerhouses (the Crown, Hope, Magnet, Railway and Remedy Bar in Stockport and the Crown and Kettle, Piccadilly Tap and Smithfield Market Tavern in Manchester); the Bakers Vaults sort of spans both categories, a modernised traditional pub which mainly sells Robinsons beers, alongside a few guest ones, but also serves food and coffee and has live music. Best beer: Five Points Railway Porter in the Piccadilly Tap. Happy New Year to you all, hope to see you at a bar somewhere in 2018.